With overwhelming bipartisan support, the House last week approved legislation to greatly enhance the public’s ability to track every cent Pennsylvania receives and how the state spends taxpayer dollars. House Bill 1843 would enhance the Pennsylvania Treasury’s Transparency Portal website and make the program permanent so it is always available to taxpayers. To help reduce incidents of distracted driving in Pennsylvania, the House Transportation Committee recently endorsed House Bill 1684, which would prohibit the use of hand-held mobile telephones and similar devices, except with the use of hands-free accessories, while operating a motor vehicle. Under the bill, all motorists ages 18 and older would be prohibited from using a hand-held phone while the automobile is in motion. Additionally, drivers under the age of 18 would be prohibited from using both hand-held and hands-free devices. The bill would also make it clear that if an individual is holding his or her device while the car is in motion, he or she is presumed to be using it. The first offense for violating this law would be $50 and two points to a driver’s license and $100 for a second or each subsequent offense. The northeastern region of the United States – including New York, New Jersey, Connecticut, Maryland, Delaware, Vermont, New Hampshire and West Virginia – all ban hand-held cell phone use. In total, 16 states ban hand-held cell phone use. The bill has now been sent for consideration to the entire House. 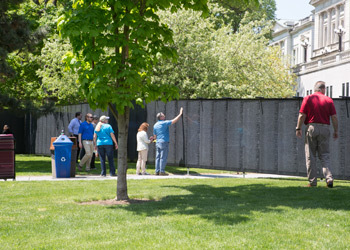 Already this week, thousands of Pennsylvanians have visited The Wall That Heals, a replica of the Vietnam Veterans Memorial in Washington, D.C., on the grounds of the State Capitol Complex. “The Wall That Heals” and an accompanying mobile Education Center has been on display since opening ceremonies on Wednesday, May 9, and will be available for public viewing, 24 hours a day, until 2 p.m. on Sunday, May 13. Admission is free. Additional information about the mobile replica can be found at thewallthatheals.org. For more information about the Capitol event, visit legis.state.pa.us/TWTH. The Pennsylvania Department of Military and Veterans Affairs (DMVA) is currently conducting an online survey to identify issues of concern to Pennsylvania’s approximately 60,000 women veterans. The survey will be available through June 18 here. The Amputee and Paralyzed Veterans Pension program offers eligible Pennsylvania veterans a pension of $150 per month through the Department of Military and Veterans Affairs (DMVA). To be eligible, veterans must have served in the military honorably; resided in Pennsylvania upon entering the military; suffered a service-connected injury or incurred a disease resulting in the loss or loss of use of two or more extremities (arms/hands or legs/feet); and have at least a 40 percent disability compensation rating or higher in each limb as determined and certified by the United States Department of Veterans Affairs. Pennsylvania veterans should contact the County Veterans Affairs Director in the county they reside to apply. More information about the DMVA Amputee and Paralyzed Veterans Pension program can be found at Pension Program. About 1,800 veterans are currently enrolled in the program. We had a wonderful turnout on Tuesday evening at our Spring Artist Reception in my Bloomsburg district office. 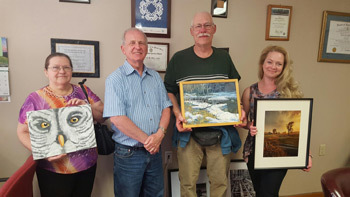 Local artists (pictured from left) Freda Quail, Tim Weaver and Michelle Yost showcased their talents, and their work will be on display in my Berwick, Bloomsburg and Harrisburg offices. Thank you to all those who attended this special event. I met with nurse anesthetists from Geisinger Medical Center regarding their legislative concerns. 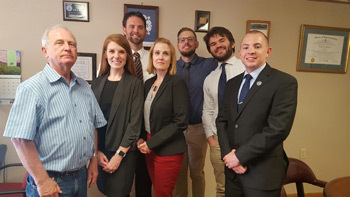 Pictured with me (from left) are Brittany Miller, Luke Pisker, Jessica Danner, Ryan Rohla, Nathan Tomlinson and Christopher Heiss. 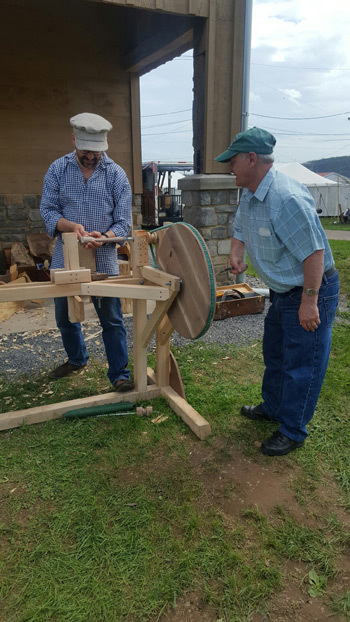 Last Friday, I visited the “History Come Alive” civil war encampment and craft demonstration at the Bloomsburg Fairgrounds. Michael McCay from Bloomsburg demonstrated the lathe. Off-roading is a recreational activity that can be enjoyed by children and adults alike, but the risk of injury is present for all when these vehicles are driven across rough and rocky terrain. Data from the Center for Disease Control (CDC) reports that nonfatal injuries caused by dirt bike accidents increased by a third from 2001 to 2004, the last period for which data is available. Injuries suffered while riding a dirt bike can be painful, life-altering or even fatal, whether racing motocross or traversing trails in the woods. •	Wear a DOT-compliant helmet, goggles, long sleeves, long pants, over-the-ankle boots and gloves. •	Except for dual-purpose models, never ride on paved surfaces, except to cross when done safely and permitted by law. Another vehicle could hit you. Dirt bikes are designed to be operated off-highway. •	Never ride under the influence of alcohol or drugs. •	Supervise riders younger than age 16. Dirt bikes are not toys. •	Never permit youngsters to ride dirt bikes that are too tall or too powerful for their capabilities. •	Don’t ride alone on remote trails. Use the buddy system. •	Ride only on designated trails and at a safe speed. •	Take a hands-on riding course. • Buckhorn United Methodist Church Community Sale will be held on Friday, May 11, from 8 a.m. to 3 p.m.
• The Jingle Hall-Berwick Car Cruise will be held on Wednesday, May 16, from 5-8 p.m.
• West Berwick School will be holding its carnival on Friday, May 18, from 5-8 p.m.
• Catawissa Community Sales will be held on Saturday, May 26. • Monthly Radio Address: Thursday, May 31, at 8:30 a.m. on WHLM 94.7 FM.